A vote on whether or not to refer a decision over hyper acute stroke units back to government has been delayed. Members of Kent County Council’s health scrutiny panel met yesterday (March 22) but due to ‘protocols’ were unable to make a decision to refer back to government the Kent and Medway NHS plans to implement three hyper-acute stroke units across the region. The proposals will mean the closure of existing acute units at hospitals including Margate’s QEQM. The nearest unit to Thanet will be at Ashford’s William Harvey Hospital. Units at Darent Valley and Maidstone are due to go live in March 2020 followed by WHH in spring 2021. Panel rules mean the committee referring back has to make ‘attempts for resolution’ – in this case with the Joint Clinical Commissioning Groups who have already voted to go ahead with the hyper-acute stroke unit plan. Instead members voted to ask the NHS to address concerns over the proposal, specifically the impact plans would have on Thanet residents who would have to travel for more than an hour to reach the planned acute unit at the William Harvey Hospital in Ashford. It adds that the proposal “presents an unacceptable and increased risk of mortality or permanent impairment of health” to an estimated 145,000 residents in Thanet. The committee asks the JCCG to come back with a response ahead of a final determination over whether to refer the decision to government for review. They added that the statement about mortality was made “with no evidence -and contrary to NHS predictions that the decision will reduce mortality and disability.” They add that the numbers are also incorrect and if there were impact, which they say there will not be, it would apply to around 500 patients a year admitted to Thanet. The decision could mean a delay until May or June for the issue to come back to the panel. 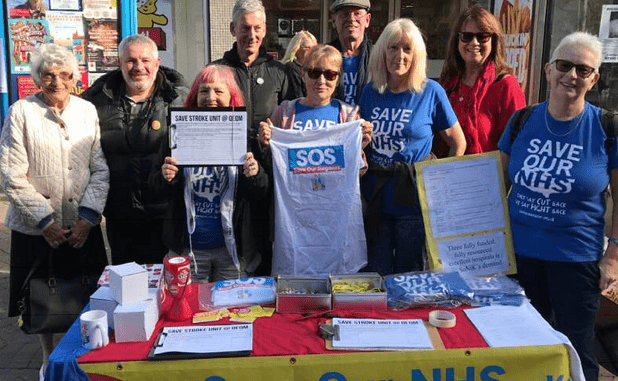 Campaign group Save Our NHS in Kent say the delay is ‘unnecessary,’ but spokesperson Carly Jeffrey added: “ However, we were encouraged to see councillors united in their scepticism towards the plans and their preference for more than three HASUs in Kent. We will keep pushing for referral back, and we hope the councillors stick to their guns and refer back at the next opportunity. Moves by the Thanet Stroke Campaign group also continue with a view to lodging a preliminary case for Judicial Review in May aimed at reviewing the process used to make the stroke decision. A spokesman for the campaign said the health committee meeting, although delaying the decision due to rules brought in in 2013, had been ‘positive,’ with ‘strong speeches’ against the viability of the NHS plans. Rachel Jones, Director of the Kent and Medway Stroke Review, said: “We are disappointed that the Kent Health Overview and Scrutiny Committee (HOSC) is questioning whether the decision taken by Kent and Medway doctors to establish hyper acute and acute stroke units in Dartford, Maidstone and Ashford is in the best interest of the health service in the area. “Councillors from the Kent scrutiny committee were involved at every stage of the stroke services review, as part of a Joint Health Overview and Scrutiny Committee formed with the three other councils impacted by the review. In February, this Joint HOSC voted to support the NHS decision to establish three hyper acute stroke units at Darent Valley Hospital in Dartford, Maidstone Hospital and William Harvey Hospital in Ashford. “The four hospital trusts in Kent and Medway, as well as our senior stroke consultants, support the plans for three hyper acute stroke units which will be able to provide expert care, 24 hours a day, seven days a week. This will reduce patients’ risk of dying in the high-risk days after a stroke and minimise their risk of long-term disability. We believe our plans will enable us to best meet the needs of our whole population and save an extra life every fortnight. The facts are. The last time KCC remitted anything back to the Secretary of State was 2010. New legislation came in in 2013. The HOSC were advised by KCC legal department that they should, under the new legislation allow an opportunity for the NHS to improve the plan. If the NHS fail to improve (and it’s difficult to see how they can ) then the matter will be voted on again and will be referred to the SoS. The plans will be voted on again in May or June, and SONIK hope that no more unnecessary delays are created. If the vote passes, the plans will be referred to the Secretary of State for Health, Matt Hancock. We are still relying on those 17 HOSC councillors at KCC to do the right thing and vote to refer back. SONIK will launch another letter writing campaign nearer the time of the vote. It is a shame that this matter is being deferred until after the May 2 elections, as the electorate will be voting based on a promise from the councillors; if the vote had taken place last Friday, then the public would be able to vote with full knowledge of the actions of each cllr. It is important that campaigners and the public keep the pressure on these councillors to do the right thing. For the avoidance of doubt, your Labour County Councillors, myself included have been fighting this at every step of the way, not only the matter of the HASU, but the wide range of NHS issues, such as the Millbrook health contract, the introduction of GP super hubs, and mental health provision across Thanet. We meet with the NHS regularly, we hold them to account, we put forward FOI’s and we support residents individually. Latterly a genuinely cross party, non party political group has been formed to persue a Judicial Review. It is important to note the complexity of the legislation we are obligated to follow. These is the legislation that the legal advisors at KCC are following. It seems clear to me wading through these that it is a responsibility of KCC to seek to resolve the plan, prior to referencing back to the Secretary of State. I don’t like this delay either. SONIK is holding a public meeting in Ramsgate this Thursday (Mar 28) at 7pm, Broad St Hall, 3a Broad St, Ramsgate. Please come along to have your say and find out what’s happening next. SONIK have asked the KCC officers to provide us with a copy of the legal advice that this decision (to delay until May/June) was based on. We also requested to know who provided the legal advice and asked for clarification on a key point. Rather than just provide the advice, or respond, they have forwarded the whole request to Freedom of Information team. This means that it will probably take abut 20 working days to answer. This is a shame and doesn’t seem to be as accountable or transparent as it could be. I’m not sure what aspect of the legal advice would require secrecy, and don’t understand why it was not published with the rest of the information for the meeting, on the KCC website. The move to use a rigid interpretation of HOSC protocols and legal advice to delay the decision seems to come from the chair of the HOSC and the officers, not (as far as I am aware) from the rest of the councillors on the HOSC. This is a cop out by the department of health. Who put these commissioners in place who are not accountable for people’s health. Now is time to abolish these commissioners. Definitely a post code lottery that was supposed to be stopped.